The ATmega1284 is a desirable chip to work with: it provides a generous 128 Kbytes of flash memory, 4 Kbytes of EEPROM, and 16 Kbytes RAM, twice as much RAM as the ATmega2560. It also has the advantage that it's available in a DIP package, so it fits on a prototyping board and is easy to wire up, and is nearly half the price of the ATmega2560. Surprisingly there isn't currently an official Arduino board based on it. Its large RAM capacity makes it the best AVR processor for running programming language interpreters. I wanted to test it as a platform for my uLisp Lisp interpreter for the Arduino, and this article describes my experiences. If you're not interested in using the Arduino core functions, like millis() and digitalWrite(), the simplest way to program the ATmega1284 from the Arduino IDE is using In-System Programming (ISP) with an empty core, as described in my earlier article Using the Arduino IDE Without Cores. This will add two new options to the Boards menu, for an ATmega1284 with the default 1 MHz internal oscillator, or with an 8 MHz internal oscillator. Connecting the Tiny AVR Programmer Board to an ATmega1284 for ISP programming. Alternatively you can use another suitable ISP programmer, such as an Arduino Uno as described in Installing a bootloader below. If you want to reprogram the fuses to use the 8 MHz internal clock download the following file empty.zip, unzip it into empty.hex, and put this in the bootloaders directory, which is in the avr directory containing the boards.txt file. This empty file is needed to allow you to use the Burn Bootloader command to set the fuses, even if you don't actually want to upload a bootloader. To select the 8 MHz internal oscillator select the ATmega1284 @ 8 MHz (internal oscillator; BOD disabled) option, and choose Burn Bootloader to set the fuses. Then upload the program again and the Blink program should flash eight times faster. If you want to program the ATmega1284P using ISP, and use the Arduino core functions, the best option is to install Jack Christensen's Mighty 1284P core, which he has updated to work with version 1.6.x of the Arduino IDE . Install the mighty-1284p folder in the hardware folder in your Arduino folder and restart the Arduino IDE. This should add a Mighty-1284p Boards section at the bottom of your Boards submenu with several alternative board definitions. Then upload the program using the Tiny AVR Programmer Board as in the previous section (see ATtiny-Based Beginner's Kit). Alternatively you can use another suitable ISP programmer, such as an Arduino Uno as described in Installing a bootloader below. 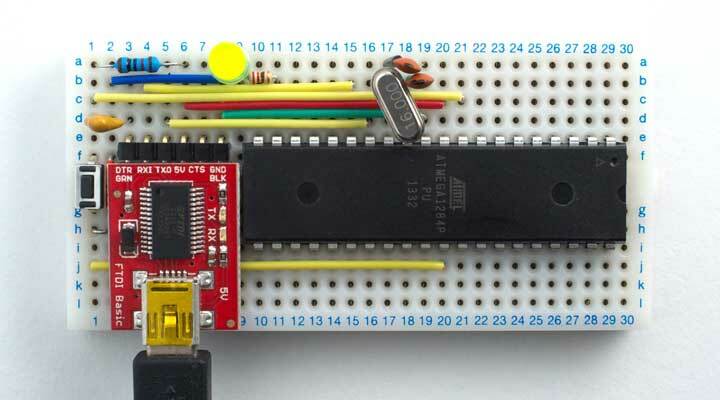 The standard Arduino Blink program should blink an LED connected to pin 19 of the ATmega1284. If you want to program the ATmega1284P via the serial port, and use the Serial Monitor for debugging, you will need a bootloader. You can either buy an ATmega1284P chip with a bootloader already installed, or install a bootloader yourself using ISP as described in the next section. To use the ATmega1284P with the Arduino core functions I used Jack Christensen's Mighty 1284P core, which works happily with version 1.6.x of the Arduino IDE . 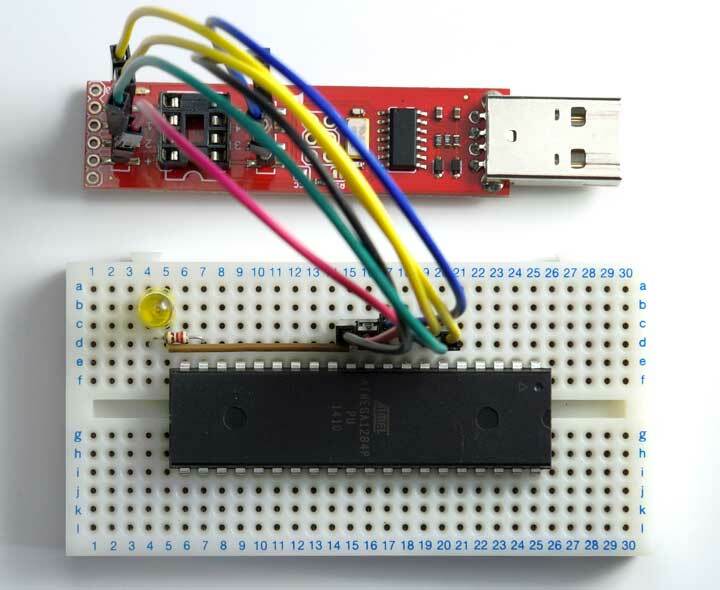 Connecting an FTDI USB-to-serial converter board to an ATmega1284 for serial programming. Circuit to connect an FTDI USB-to-serial converter board to an ATmega1284. You should now be able to upload the standard Arduino Blink program, which should blink an LED connected to pin 19 of the ATmega1284. Connecting an Arduino Uno to an ATmega1284 for ISP programming. Install the Mighty 1284P core. On the Tools -> Board submenu choose Arduino/Genuino Uno. Select the sketch File -> Examples -> 11.ArduinoISP -> ArduinoISP and upload it to the Arduino Uno. On the Tools -> Board submenu choose "maniacbug" Mighty 1284p 16MHz using Optiboot. Select Tools -> Programmer -> Arduino as ISP. You should then be able to disconnect the Arduino Uno, connect the FTDI USB-to-serial converter, and upload programs via the USB port. 3rd October 2016: Added the Reset connection, which I'd missed from the circuit diagram of programming an ATmega1284 using an Arduino. ^ Mighty 1284P core on Github. ^ Using an Arduino as an AVR ISP on Arduino.cc.